Learn a New Card Game – 99 – Fun and Easy! 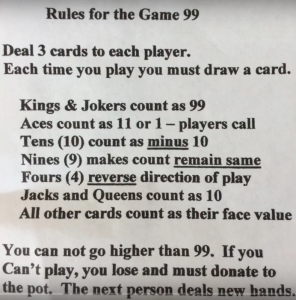 Do you know how to play the card game 99? Why should you learn a new game? For one thing, games are fun, but another reason is, studies show learning new skills helps improve our brains. “A study published in the New England Journal of Medicine reported there are leisure activities that can help prevent Alzheimer’s and dementia. 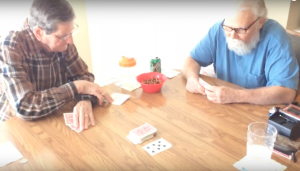 Although these seniors had various issues, from sleep deprivation, Alzheimer’s, a critical illness (just had a chemo infusion) and a bad case of dingbat-itis, they enjoyed this super fun card game. The video starts with an open hand demonstration. 99 is a great game for brushing up on adding, subtracting, and paying attention, mindfulness. Each player is dealt three cards. Once a card is played, the player picks up a new card from the center pile. Everyone has a copy of the cheat sheet (below) next to them to refer to while playing. 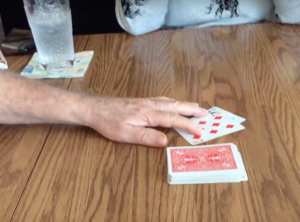 Thanks to using the cheat sheet, my father is able to play a game like this, despite having Alzheimer’s. He’s been playing this for years and never needed the cheat sheet before memory problems started. Take a screen shot so you can print it out. Each player starts out with three quarters or three dollars bills if you’re a big gambler. Haha! If you’re out of quarters, use pennies, buttons, or whatever you’d like. You get the gist. If someone is unable to play a card, they lose one quarter, and that is the end of that round. The next person deals the new hand. 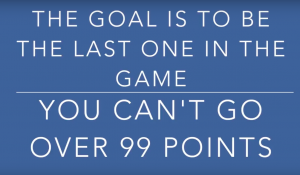 When a player loses all three quarters, they’re out of the game. The remaining players continue to play until only one player has a quarter left and the others have lost all of theirs. The cheat sheets sure come in handy! Watch the video and see if you notice our mistakes. No biggie. It’s a very kick-back game. I hope you enjoy hours of fun. What are your thoughts? Do you like to play card games and board games? What’s your favorite if you do? Are you learning a new skill? I’d love to hear from you! This entry was posted in Games, Grammy Gets It, Lynn Kelley and tagged card game 99, cheat sheet. Bookmark the permalink. 7 Responses to Learn a New Card Game – 99 – Fun and Easy! That sounds like a fun game. We’ll have to try it. We play a lot of card and board games. We play a lot of card and board games, too. I think you’ll enjoy playing 99, Alex! Sounds like fun and can be played anywhere as cards easily travel. My family is mad about card games. We have to play every time we gather. My nephew and his uncle on the Maori side of the family are two card whizzes. They get frustrated when they go to play with the rest of the family and they’re the only ones who know how to play 56 different card games! Excellent tips. We need all the help we can get against dementia! All around the globe card games and other games are being used as a tool, even in our country, Finland. Yes! Wonderful to hear people all over the world are playing games to create new brain pathways, help us stay alert, and have a great time while we’re at it! Thanks so much for stopping by!